Introducing the exclusive Bridgestone Dueler LTH, a truck and SUV highway tire that offers comfort, all-season performance, and extended tread life. With it's state of the art computer design and advanced materials, the Dueler LTH provides responsive handling while offering a comfortable ride. 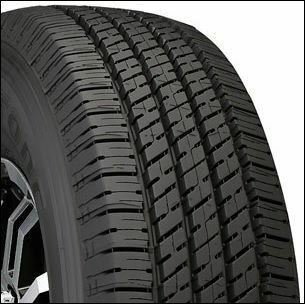 The Bridgestone Dueler LTH features full depth sipes and grooves that allow for confident all-season performance throughout the life of the tire. In rain or snow, no matter the weather, drivers can expect traction. 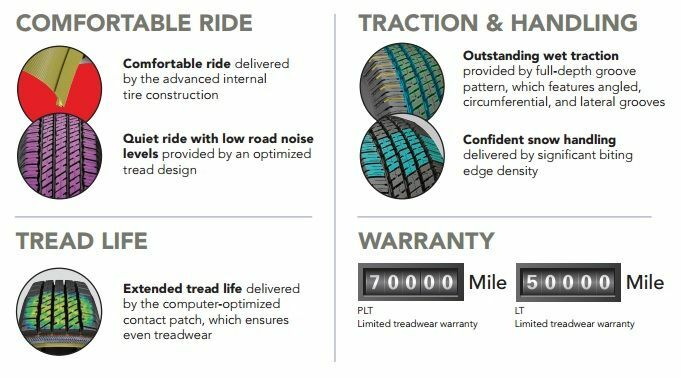 The unique footprint is computer optimized for even treadwear to provide long lasting tread life that is backed by a 70,000 mile warranty for SL sizes and 50,000 mile on LT sizes. Right now during our Presidents' Day Deals event you can save $100.00 back by mail with the purchase of a set of four(4) LTH tires. Purchase with Discount Tire credit and save an additional $60.00 for a combined savings of $160.00! Buy some ear plugs if you have them installed! They make a lot of noise! Now through May 7th, 2018 save $70.00 back by mail with the purchase of four(4) select Bridgestone tires which include the Dueller LTH!